There is nothing to stop us reviving the UK economy via resurgent performance in manufacturing, exporting and import substitution provided we get the cost base charged out to the rest of the world on a competitive basis. The Pound Campaign believes that the main reason why the UK economy is in its current dangerously unbalanced state is that the exchange rate is far too high. If sterling was at a much more competitive level, combined with all the supply side remedies which would need to be implemented at the same time, about which there is little dispute, the economy would do very much better The growth rate could be raised to 4% to 5% per annum on a sustainable basis; unemployment would fall towards 3%; investment as a proportion of GDP would rise from the current pitiful levels – barely 14% - to around the 24% world average; the economy would be rebalanced towards 15% of GDP coming from manufacturing rather than the current 10%, enabling us to pay our way in the world; neither the balance of payments nor government borrowing would continue to be a problem as we stopped accumulating debt at an unsustainable rate; and both regional and socio-economic levels of inequality would be reduced. Why, then, are so few people considering getting the exchange rate down to a competitive level? It is partly because most people seem to think that international trade is not very price sensitive - although most of it in fact is highly price critical – so therefore it doesn’t matter what the exchange rate is. It is also, however, because of a widely held belief that pursuing an active exchange rate policy is unachievable. This Bulletin looks at each of the arguments put forward for this second proposition and shows how weak each of them is. 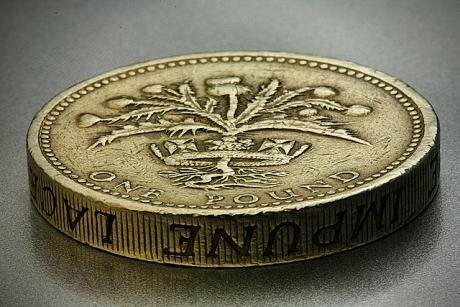 Devaluation causes Inflation It is very widely believed that moving to a lower value for the pound must increase inflation. Monetarists have always claimed that any gains in competitiveness from a weaker currency must be offset in short order by more rapid price increases. Everyone can see that a lower pound entails higher import prices and more expensive foreign holidays and thus – apparently - more inflation. But what seems obvious needs to be checked against the facts – and economic statistics – of which there are large amounts available – tell a very different story. Sometimes devaluations increase inflation; sometimes they decrease it; but most of the time inflation stays much the same as it would have been anyway. The reason is that a lower exchange rate also brings many costs down as well as putting some up. Tax and interest rates can be lower; investment rises, producing better and cheaper goods; production runs increase giving increased economies of scale; productivity increases, soaking up wage rises; domestic suppliers not affected by higher import prices become competitive. For all these reasons, devaluations do not necessarily increase inflation. Indeed they do not usually do so at all. Increased inflation as a result of a devaluation is simply not what generally happens. That it does is a myth as any careful look at economic history shows. Governments can’t change the exchange rate There is a widely held perception that governments cannot change exchange rates. Currency parities are thought to be fixed by market forces, which cannot be bucked. The mistake here is to fail to recognise that there is much which can be done by governments to affect the way in which markets behave, making it unnecessary to fight against them. Historically, for example, we have tended to have higher interest rates than elsewhere in the world, thus pushing up sterling’s value. A major reason why sterling has been so strong especially in recent years is that we make it far easier than in any other country for foreign interests to buy UK assets, increasing the demand for sterling dramatically in the process. This could – and should – be changed. We benefit from foreign investment in factories and machinery but selling off portfolio assets such as shares, bonds and property, to finance living standards which we cannot really afford, does nothing to improve our economic prospects. If policy changes in areas such as these are implemented by a government which is clearly minded to get the exchange rate down, while co-ordinating fiscal and monetary policies in the same direction, the exchange rate will fall just as it did in Japan recently, where the government got the yen down against the dollar by a third in a year by implementing similar policies to those we need in the UK. There would be retaliation Nobody wants to get involved in a currency war but there is no reason why this should happen. This is partly because there is so much objective evidence that sterling is grossly overvalued, making it irrational for other countries to oppose getting it to a more competitive level; partly because, if we had a much lower exchange rate, it would still be rational for us to continue running a balance of payments deficit, to keep it down; partly because our share of world trade is now so low – at barely 2.5% - that what we do does not make much difference to everyone else; partly because the dollar is the world’s reserve currency and the Eurozone has many other problems to contend with, so neither of them would be in a good position to retaliate even if they were minded to do so; and finally because it makes no sense for the UK to run up larger and larger deficits and debts, as a result of our currency being too strong, which we are never going to be able to repay. When the pound fell between 2007 and 2009 from its peak of $2.10 to its trough of $1.36, there was no sign of any retaliation. Why should the future be any different? A lower pound would make us all poorer If the pound had a much lower foreign value than it does now, enabling us to sell all our goods and services at much cheaper prices on world markets, it seems at first sight as though – if we are charging out our labour costs to the rest of the world at lower prices than before – we must be making ourselves poorer and lowering our living standards. This is not, however, what actually happens. Of course, if UK incomes are measured in dollars and sterling is devalued, then measured in dollars our incomes will indeed have gone down. People in the UK, however, do not do their shopping in dollars, except perhaps if they are on holiday. They pay for almost all the goods and services they buy in sterling and the volume of goods they buy is almost certain to increase with a lower pound. This is because a more competitive currency tends to increase exports and reduce imports, thus making the economy grow faster. If GDP is larger and the population stays the same as it was before, as a matter of logic, GDP per head must go up and not down. This indeed is what all the international measurements of GDP after devaluations tend to show happens. Scare talk about “races to the bottom” if sterling had a much lower value are therefore completely misplaced. The problem at the moment is that we are failing to provide jobs for everyone because large sections of the UK labour force are priced out of world markets as a result of sterling being much too strong. We need to price all our labour force back into the world market, thus increasing productivity and living standards. We have tried devaluations before and they do not work It is, of course, true that, although there have been fluctuations up and down, on the whole sterling has fallen significantly in value against most other major currencies since World War II. There is, however, a very obvious reason why this had to happen. Inflation in the UK has been substantially higher than it has been in most other developed countries and in these circumstances the devaluations which took place in 1949, 1967, 1992 and between 2007 and 2009 were inevitable. The issue is not, therefore, whether no exchange rate changes should have ever taken place. Clearly they had to happen. The key question is whether the devaluations which occurred were early enough and on a sufficient scale to deal with the lack of competitiveness which forced them to take place. Unfortunately, the evidence is that all of them were too little and too late. Instead they only happened when they were forced upon us by doubting markets. The parity reductions were then kept as low as possible. The result has been that for many decades our economy has been uncompetitive; our share of world trade has steadily shrunk; our manufacturing capacity and our ability to pay our way in the world has gone down; and we have not had a balance of payments surplus since 1983 – over 30 years ago. The UK is incapable of responding to manufacturing opportunities Finally, it is argued that providing new profitable opportunities in manufacturing, exporting and import substitution in the UK is a waste of time because we would be unable to respond. The British, we are told, are no use at manufacturing and would be unable to take advantage of the highly profitable new opportunities opened up for them. Perceptions of this sort, however, are surely wrong at every level. We may not be that good at manufacturing at the moment, but the main reason for this is that most of it is so unprofitable that few talented people choose this career path. If there was money to be made, all the evidence suggests that there would be ample entrepreneurial talent in the UK which would be only too happy to take advantage of new money-making opportunities. What could we make? The quickest and simplest answer is, as well as promoting exports, to produce in the UK a reasonable proportion of the goods we currently import from the Pacific Rim which are only manufactured there rather than here because the cost base there is currently so much lower than it is in the UK. How would new industries get started? All the necessary machinery and raw materials are readily available on world markets. Would there be enough skilled labour available? The answer is that some highly skilled people would be needed, but not that many. If the cost base is in the right place, new manufacturing opportunities would provide large numbers of jobs which of course require thoroughness and careful attention but which involve operations which can be taught in many cases in only a few days. At present, all the bias is towards highly skilled, high tech operations because low-tech ones have been priced out of the market and cannot compete – but high tech is intrinsically risky and there is never enough of it. The way to an industrial revival in the UK is to make plenty of relatively low-tech and low risk manufacturing activity viable – and creating these conditions is almost entirely an exchange rate issue. The conclusion is that there is nothing to stop us reviving the UK economy via resurgent performance in manufacturing, exporting and import substitution provided we get the cost base charged out to the rest of the world on a competitive basis. Nor is there anything to stop us achieving this competitive level if we were seriously minded to do so. That is not the problem. Where the problem does lie is in perceptions about how the economy should be run. Everyone involved in economic policy knows that we have to have a reasonably well ordered fiscal policy, to provide a manageable balance between government spending and the sources of funding to pay for it. Everyone also agrees that we need monetary policy to provide the financial stability necessary for our economy to function efficiently. What almost everyone seems to have forgotten, however, is that we also need to have an exchange rate policy which enables our economy to function in a reasonably balanced way with the rest of the world. At the moment we are totally failing to do this – which is why our rate of investment is so low; why our industrial base has withered away; why we cannot pay our way in the world; why we are consequently running up debts on an unsustainable basis to pay for standards of living which we are not earning; and why our economy will be facing years of stagnation once our current upturn dies away – which it will – as a result of a mounting balance of payments crisis and rising interest rates. As long as this goes on, the future ahead of us will be one of little or no growth, stagnant living standards, high unemployment, mounting debt, rising inequality and declining national significance. All unnecessary and avoidable. This article is part of the There is an Alternative series. An economist and entrepreneur, John Mills is Chairman of JML. He recently established The Pound Campaign to raise awareness of the uncompetitive exchange rate and the effect it is having on UK manufacturing and the wider economy.